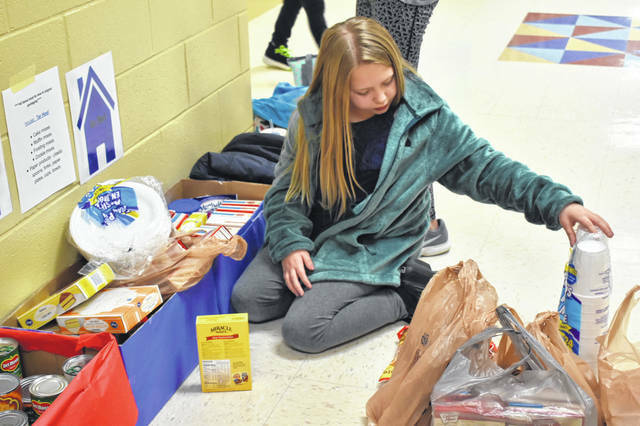 Brynna Pauley, a fifth-grader and member of the Tar Heel house, counts donations Thursday afternoon at Schultz Elementary School. Each house at Schultz had a specific list of items they were supposed to donate, and the donations will be tallied on Dec. 14. The winning team get a pizza party with athletes from Hayes High School. 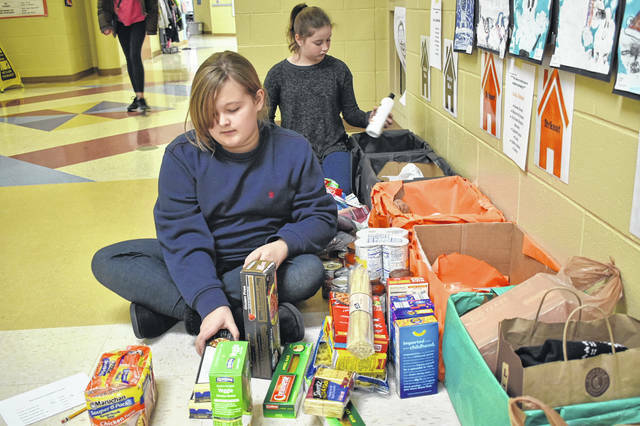 Madalinn Kinder, front, and Kayla Barnett, back, count donations for their houses Thursday. For the next week, the six houses at Schultz Elementary School in Delaware will be competing to see which house can collect the most canned goods and other items for People In Need, Inc. of Delaware County. Kathy Horner, the physical education teacher at Schultz, said the the house committee decided it wanted to do a charity project and give the houses a chance to compete. “We wanted to motivate them to be more involved and have more house spirit,” Horner said. She added each of the six houses has five families, and the leaders of the families have been appointed student leaders. Horner said the leaders will be counting the donations every few days until Dec. 14, when the donated items will be given to People In Need. Horner said each house has a different set of items it is supposed to donate, with some houses focusing on canned goods while others focus on home supplies and other items. Horner said the winning house will get a special pizza party with Pacer athletes from Hayes High School. They will be able to take photographs with the athletes or get autographs. One of the fifth-grade student leaders, Brynna Pauley, of House Tar Heel, said she’s enjoyed the competition so far. Ferah Clark, another student leader, was counting donations for her house, Best of All, and said she hopes the younger students in her house learn about compassion. Horner praised the students’ attitudes during the project. At the end of counting Thursday, Best of All leads the competition with 177 items, but Tar Heel is close behind with 176.